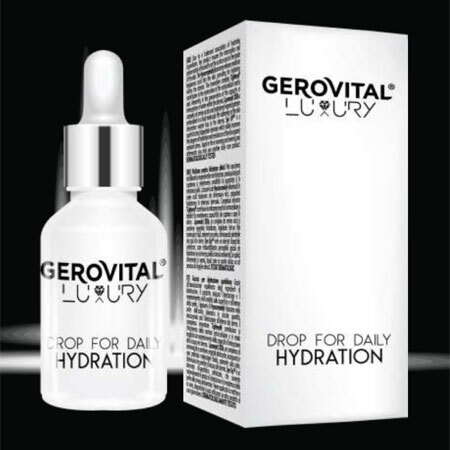 With a balanced association of hydrating ingredients, the Gerovital Luxury Drop for Daily Hydration ensures an optimum level of hydration and the retention of the water to all skin levels. This lightweight consistency cream-serum rapidly penetrates the skin infusing it with essential hydration and leaving it plumped and radiant. Hyaceramidyl has a complex action upon skin: it releases small size hyaluronic acid into the skin which maintains an optimum hydration level, provides suppleness, smoothes wrinkles, improves skin firmness and elasticity. Its formula combines anhydrous (water free) Sodium Hyaluronate with Squalane and Ceramides in a nanosome encapsulation form. Tightenyl®, an innovative active bio-lifter and bio-precursor of the extracellular matrix, penetrates beyond the superficial layer of the skin improving its firmness, tonicity, viscoelasticity, and plasticity. Lipomoist 2036, a complex of amino acids and hydrolyzed vegetable proteins, minimizes the transdermal water loss (TEWL), confers a pleasant feeling to the skin, increasing its moisture and firmness. Syn UP™ is a patented peptide which helps to restore the skin's youthful resilience and resistance against ambient stress. When the skin is resilient, dry skin is able to recover more readily. It is ideal for treating mature dry, flaky, and sensitive skin. Apply twice daily, in the morning and evening. Apply on cleansed skin all over the face, neck and décolletage. Massage gently until completely absorbed. Layer underneath of moisturizer to seal in hydration. INGREDIENTS: AQUA, GLYCERIN, UNDECANE, PENTYLENE GLYCOL, DIMETHYL ISOSORBIDE, PHENOXYETHANOL, TRIDECANE, NIACINAMIDE, HYDROXYETHYL ACRYLATE / SODIUM ACRYLOYLDIMETHYL TAURATE COPOLYMER, ISOHEXADECANE, SQUALANE, POLYACRYLATE CROSSPOLYMER-6, PROPANEDIOL, GLUCOSYL CERAMIDE, TOCOPHEROL, POLYSORBATE 60, CAPRYLYL GLYCOL, DECYLENE GLYCOL, DISODIUM ACETYL GLUCOSAMINE PHOSPHATE SODIUM GLUCURONATE, PARFUM, DISODIUM EDTA, HYDROGENATED PALM GLYCERIDES CITRATE, GLYCINE SOJA OIL, SODIUM HYALURONATE, XANTHAN GUM, TEPHROSIA PURPUREA SEED EXTRACT, HYDROLYZED VEGETABLE PROTEIN, ETHYLHEXYLGLYCERIN, BENZYLSULPHONYL D-SERYL HOMOPHENYLALANINE AMIDINOBENZAMIDE ACETATE, CITRIC ACID, BENZYL SALICYLATE, MAGNESIUM SULFATE, PECTIN, BUTYLENE GLYCOL, SERINE, ARGININE, PROLINE, SODIUM HYDROXIDE, GLUCOSE, CARRAGEENAN.